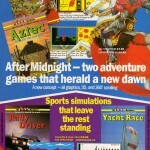 Advertised in Home Computer Weekly, issue 85 – King Arthur’s Quest was an interesting looking 3D adventure game which was to be released on the likes of the Spectrum and also the Commodore 64. You would use the keys to turn around 360 degrees and move around a 10×10 grid layout. The game overall was aimed to be a childrens adventure game, more than something for adults. Although reviewed in a few magazines, including Your Computer the C64 version never surfaced. The Spectrum version however did! It is very likely the screenshot in the advert is from the Spectrum version. It seems that Hill MacGibbon didn’t get that much released onto the C64, so maybe they struggled with that platform overall getting suitable developers.